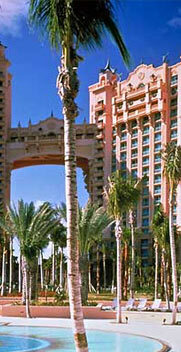 In addition to a wide variety of accommodations, Atlantis offers a unique Entertainment Center with the Caribbean’s largest casino, 38 restaurants and lounges, extensive meeting facilities, including the largest ballroom in the Caribbean/Bahamas, and more than 11 million gallons of water activities and attractions. The focal point of the 34-acre Atlantis Waterscape is the largest tropical marine habitat in the world. Larger than life, as dramatically fanciful as it is magnificent in scope and concept, the $850-million Atlantis, Paradise Island is a glorious and wonderfully playful celebration of the legends of the lost city of Atlantis reflected in unique entertainment attractions such as The Dig, a fanciful journey into the world of the ancient Atlanteans, water rides, original artworks and in the design and decor throughout the resort. Atlantis is a resort experience that is truly in keeping with Sun International’s reputation for creating not just a hotel, but an entire vacation destination, in fact, the world’s largest island resort destination. The $600-million Royal Towers, which opened in December 1998, with 1,201 guest accommodations set in two majestic towers, plus the Coral and Beach Towers provide the foundation for a 2,300-room resort that is as much fun for every kind and age of traveler as it is breathtaking and bold. Paradise Island, located on the northern edge of Nassau (New Providence Island), is a short ride from downtown Nassau and the airport. The island, formerly called Hog Island, is 826 acres, almost 70% of which is now owned by Sun International. Paradise Island became a tourism destination in 1921.